Plans from Nottingham Trent University for a new Enterprise Innovation Centre (EIC) in the city centre of Nottingham to the north of the Dryden Building have been approved. 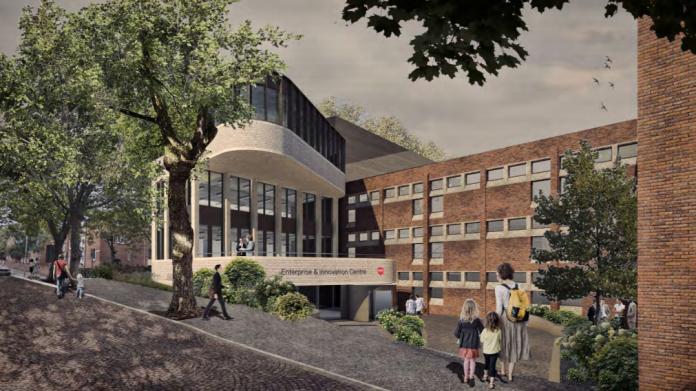 The EIC will be built on what is currently a brownfield site and will offer space for student, graduate and academic enterprise, be a base for academic-business teaching and research, and act as a centre for business support in the city. The new building will provide 2000m2 of gross internal floor area for the University. A design statement from the University said: “The EIC will form a major building block of the University’s Enterprise Action Plan and will be a key enabler of many elements within the University’s strategic plan – Creating the University of the Future. and collaborate with academics, researchers, small growing businesses and larger companies.